We’ve moved!! Come and join us on our new website. Just a quicky to say that the Feral Pigeon Project has MOVED! We now have our own dedicated website and blog and we’d love you to join us there. Simply visit http://www.feralpigeonproject.com for all the latest on these amazing birds! We look forward to welcoming you to our new site. It was fantastic to read the review of citizen science that was commissioned by the UK Environmental Observation Framework (UK-EOF). As with any method there are positive and negative points associated with citizen science, but thankfully it is become more widely recognised as reliable method of data collection. Personally, I feel the major benefit to this work is the connection to both science and the natural world that it cam instil. Many people go about their lives without giving a second thought to the fascinating world of urban ecology that is right in front of them. Pigeons are often one of the first wild creatures children come in to contact with. I also firmly believe that children can benefit immensely from being introduced to the natural world and that such early lessons can instil a life long love of the natural world. Citizen science can add an element of fun and even friendly competition to aid engagement. Who hasn’t witnessed a child chasing a pigeon in a town centre? 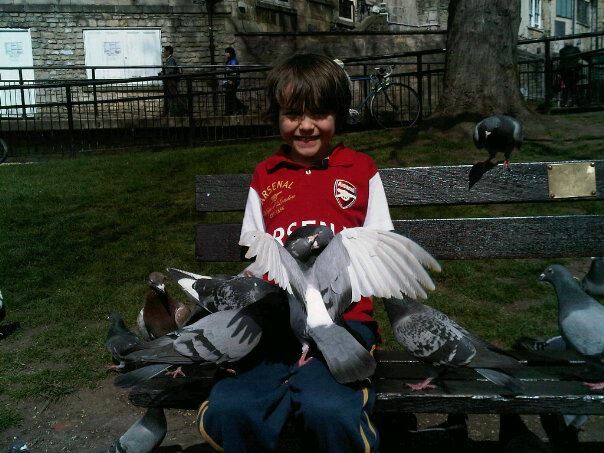 I believe children taught from an early age to respect pigeons, rather than chase them may develop respect for the creatures we share our planet with. If we are to raise a generation of children willing to protect the rare and the unusual, we need to start at home with the familiar, and in my view, equally wonderful. The blog shows a photo of a feral pigeon enjoying berries in much the same was as their larger cousins, the wood pigeon (Colubma palumbus). Feral pigeons munching on berries is something I’ve never witnessed but it must happen more often than we realise. Many pigeons outside the UK regularly fly to and from feeding grounds outside of the city/town to feed, especially on fields of peas. Although peas are not a ‘wild’ food, it clearly shows they have the instincts and ability to make the most of any opportunity. Does anyone else have any photos of pigeons eating ‘wild food’? I’d love to see them. Do check out Pigeons as Pets… The wonderful Elmo and Georgie are legendary. Living with an animal allows a unique insight into behaviour that would often go unseen, equally, it also allows behaviour to be seen in a unique context and with minimal outside interference. One such behaviour is the flight intention movements of pigeons. The term ‘flight intention’ was coined by Lorenz, but now isn’t used as regularly as some believe the phrase implies too much concious thought. Personally, I question this as, living closely with a pigeon, it is clear that flight intention movements are not used with the regularity and predictability one might expect if they were not under concious control. A flight intention movement is a ritualised moment or set of movements, used to signal to other birds in a flock that an individual is about to take flight. This allows the other flock members to be aware of who is about to leave and who has no intention of leaving. In that way, if a flock member takes off unexpectedly without having used flight intention movements beforehand, the other flock members will immediately follow. An assumption can be made that the bird that took off in a hurry may have spotted danger and therefore the others should follow its lead to be on the safe side. This got me wondering, what circumstances do pigeons need to use flight intention moments to stop others from flying? An experiment by Davis (1975) showed that birds shocked into rapid flight with an electric plate immediately induced flight in other flock members, however, occasionally unnecessary alarm flight can occur. This may be due to birds failing to read the flight intention movements of a fellow flock member. However, given the complexity of needing to forage, watch for predators and monitor all surrounding birds, it is clear that mistakes must occasionally be made. If these moments are under concious control, do some birds simply forget to give then at the correct times? This leads me on to the use of vocal alarm calls – from my own experience, pigeons utter an alarm ‘coo’ upon seeing a predator such a bird of prey. This is often combined with a tall and upward stance. Strangely, I have seen this behaviour uttered in response to both aerial predators and ground predators. I had wondered if this sound may have been conveying the message “Danger! But stay put, don’t fly!” but its use on seeing a cat may say otherwise. I’d love to know if anyone has witnessed the response of other pigeons to this ‘alarm coo’. Feed the birds… tuppence a trolley load. Two posts in one day is a bit much, but once my mind starts pondering, it’s best to get it written down! I hail from Trowbridge, a leafy(ish) town in sunny Wiltshire, where a pigeon scandal is rife. 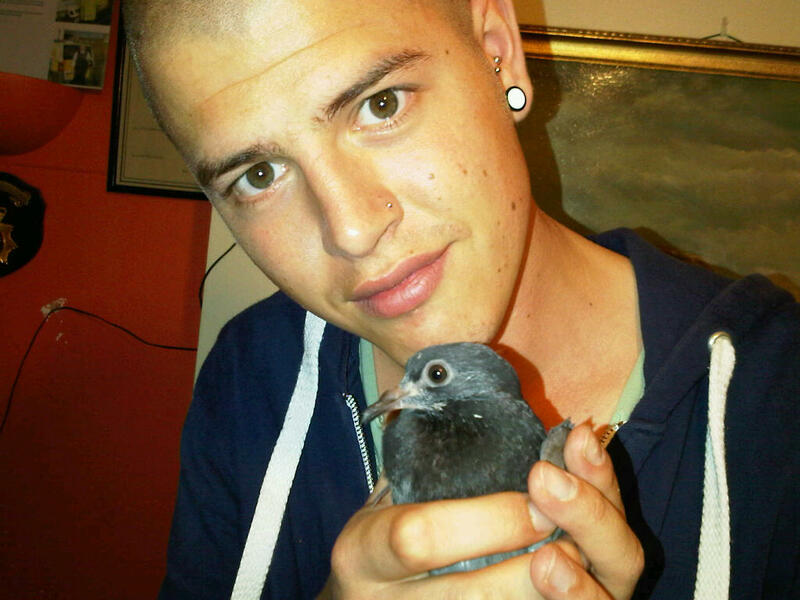 A few years ago, ASBOs were handed out to pensioners for ‘excessively feeding pigeons’ and supposedly causing a massive over population. Granted, there are many pigeons in Trowbridge, possibly in excess of 1000 (I cannot find exact surveyed figures anywhere so this is an estimate). Going by figures stated by Johnson and Janiga (1995), each pigeon must consume 35g of food on average per feed with generally two feeds per day. Therefore, 1000 pigeons, needing 70g of food per day, totals 70kg of food. If an average loaf of bread weighs 750g, then 93.3 loaves of bread would need to be fed to the pigeons daily. No mean feat for a pensioner! Clearly, it’s inconceivable that such a large amount of food could be provided, even by ‘excessive feeders’, not to mention the costs spiralling (around £326 per week if feeding bread, far more than any pension would provide). Studies have shown that feral pigeons consume far more ‘natural’ food than one would imagine, as clearly such large flocks could not live on bread alone. In human society we are often encouraged to be different, unique, to follow our own path or to stand out from the crowd. However, is the same true for pigeons? I have been lucky enough to have been contacted by researchers interested in this topic, which got me thinking. They brought to my attention a study investigating goshawk (Accipiter gentilis) hunting habits (see the study here: www.cell.com/current-biology/abstract/S0960-9822(12)00315-6). It was found that rare or unusual phenotypes were chosen as prey items above and beyond the more common phenotypes in the flocks they were hunting. You would imagine that such hunting pressure would select against the rare phenotype causing flocks to become uniform. However, negative assortative mating in pigeons means rare phenotypes are highly sought after as mates, perpetuating the ‘rare’ phenotypes. Is this the end of the matter? Is negative assortative mating sufficient to maintain plumage variation in face of hunting pressure? Anthropogenic influences may also have an effect. 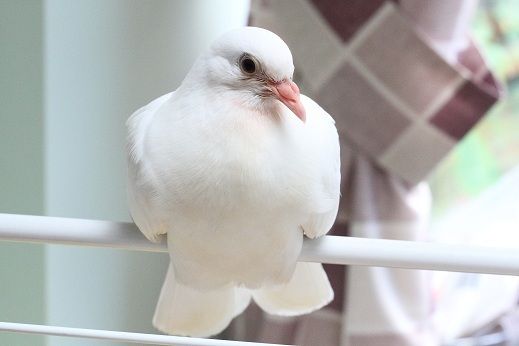 For example, when counting pigeons earlier in the year, I encountered a man abandoning a fledgling captive bred white pigeon into a town flock. She was too young to survive on her own and so came home with me for hand rearing. Given what is known about the oddity effect it would be unfair to release her and so she currently remains with me. But it does make you wonder how much of the gene pool consists of escaped/released individuals and how much is the result of negative assortative mating. Equally, it is known that melanic male pigeons have less gonadal regression and can breed for longer when they have access to sufficient food. Could white or red individuals have other unknown traits that help them prevail? From what we know, being the odd one out for a feral pigeon is both a curse and a blessing. As an unusual phenotype an individual may find a mate more easily and (if male) may have more extra pair matings and therefore may have greater lifetime reproductive success. Given that unusual phenotypes are, just that, unusual, it is evident that selective pressure against such phenotypes must be strong. It is clear there is still lots to be learned about these familiar birds. And as for the white pigeon, she is currently teaching me a lot about post juvenile moult by spreading her feathers all over my lounge. Here she is roosting on a clothes horse. As scientists, it is often said that we shouldn’t interfere with the natural order of things. However, when endeavouring to discover more about a species or habitat, it is inevitable some human interference will occur. Just your presence or the presence of equipment may impact any data received. Then there is the dreaded word, compassion. I don’t believe it is ‘soft’ for even a hardened professor to see an animal in distress and feel the need to help. Now, I’m not suggesting we all intervene with lion kills or nest predation, but there are times when compassion rules science. Such a situation occurred when I was counting pigeon phenotypes in a local town. Dodging the traffic in a busy car park was a young pigeon that had clearly fledged too soon. Lost and in danger of being run over, compassion told me I had to help, so I offered the hand of compassion to another being. I’m pleased to say the youngster is doing well, gaining wait and is full of beans. He will of course be added to the data set for his area before release! Pigeon plumage polymorphism, the results so far. I’m pleased to say I now have data from over 500 individual pigeons from various locations throughout the UK. Thanks to everyone who kindly submitted details of their local flock. The data, shown below, has confirmed research that has been conducted previously but leaves many unanswered questions. It also shows how interesting feral pigeons are to study. Of the 503 birds, 58.96% show the checker plumage type whilst 25.24% show the wild type or ‘blue bar’ plumage. There are many theories as to why this may be the case, for example, it has been found that checker birds have an extended breeding season over the wild type birds, as they do not show the gonadal regression found in the blue bar birds. Gonadal regression in the winter months has been found to be linked to the ability to store fat for surviving in times of food shortage and cold weather. Such an ability would be essential for wild rock doves with seasonal variation in nutrient availability. 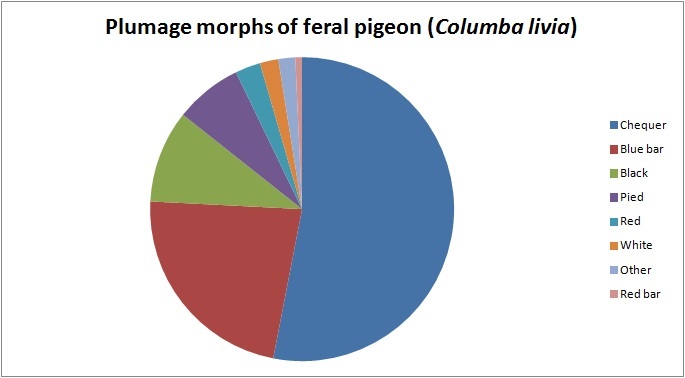 However, feral pigeons are far less subject to fluctuation in food availability and therefore, gonadal regression may be less of an advantage. Interestingly, it has been found that city living blue bar birds have higher lead and cadmium levels than checker birds – despite the banning of leaded petrol, cadmium is readily found in car tyres and is deposited on roads and curb sides. Such contamination may possible effect the breeding success and health of blue bar individuals. Equally, female mate choice may be playing a part, which is something I hope to research in the near future. Thank you again to everyone who has helped… please keep those results coming in. I’ll also need more help in the near future with some more in depth pigeon spotting. A massive thank you to UK and Eire Natural History Bloggers for kindly adding me to the network. So far we have details of 242 individual pigeons from 4 locations. Early results are certainly interesting! Of these pigeons, 62 show the blue bar (wild type) plumage, but 112 show individuals show the chequered (or check) plumage. This is interesting as the blue bar phenotype is dominant over the chequered phenotype. It would be more likely that a blue bar plumage would be inherited and expressed in an individual than the chequered plumage, so these results are not consistent with this. It may be that having a chequered plumage may be more beneficial to an individual than a blue bar plumage. Clearly, these results could be due to lack of data – hopefully more results will bring greater clarity. So, if you’re out and about, please count your pigeons! For more info, please see my last post: Let’s get pigeon spotting! Thanks again to those that have sent in their results.